A Belfast woman with Type 1 diabetes has been awarded £2,000 after security staff at a rock concert confiscated her fizzy drink. Kayla Hanna, 20, was at a Red Hot Chili Peppers concert in Belfast in 2016. 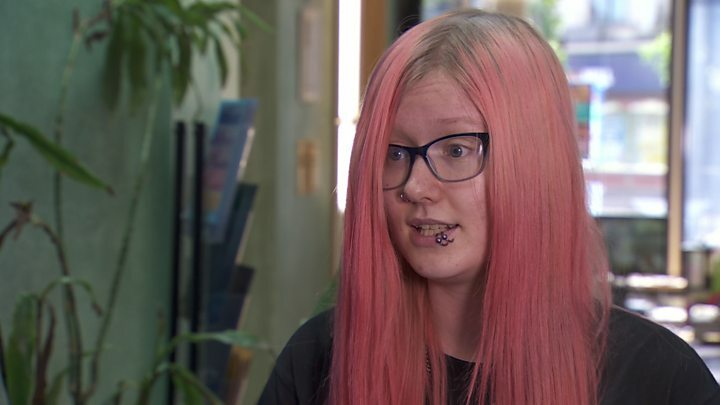 The student always carries Lucozade for her blood sugar levels, but staff employed by Eventsec Ltd removed it, despite her showing them her diabetes tattoo and insulin pack. Eventsec said it was disappointed by the ruling. The judge ruled it was discrimination. Miss Hanna, who was 18 at the time of the incident, told the court she was going into the Boucher Road concert when she was told she could not bring in her bottle. "I told her [ the security guard] of my condition and showed her the tattoos on my wrist which indicate I have diabetes," she said. "She said that 'anyone could have that' so I also showed her my insulin pack and the meter used to check my levels. "She consulted with another guard and they insisted that they had a strict policy and they would not allow me to bring the drink inside." Miss Hanna took a case under the Disability Discrimination Act 1995 and The Equality Commission for Northern Ireland supported her. She told the court she had been "very anxious and upset" throughout the gig. "I really hope that now this issue has been brought to light it won't happen again to me or other people who live with diabetes," she added. Judge Gilpin said that Eventsec Ltd had failed to provide a reasonable adjustment to its policy of not allowing liquids to be brought into the concert. An Eventsec spokesperson said it was pleased that the judge had acknowledged that the company had "considered what reasonable adjustments needed to be put in place in order to meet the needs of those patrons with diabetes". "The facts surrounding this case were an isolated incident," the company noted. Mary Kitson, senior legal officer at the Equality Commission for Northern Ireland said: "These are the kind of circumstances in which the reasonable adjustment provisions in the Disability Discrimination Act can be most beneficial". She added: "They are in the act to ensure that people with disabilities are not denied access to services by reason of general policies which can, in themselves, be otherwise justifiable and necessary. "In this case, the company should have made arrangements to ensure that Kayla could have accessed Lucozade during the concert if needed, for example by directing her to its own medical centre at the venue and providing her with a bottle of Lucozade. "That would have been a simple adjustment and would have met her medical needs." "My 16 year old son Jay is a type 1 diabetic and was diagnosed at 9. "He is a huge Arsenal fan and regularly attends games at the Emirates Stadium in London. They too have the same policy about drinks bottles, but as soon as they realise Jay is diabetic, they allow him to take in whatever he needs. "Obviously his bag is always checked by different security guards. "He always gets the same positive and helpful reaction, which shows the staff have been trained appropriately to know diabetics need something on their person to raise their blood sugar levels if necessary." "On holiday the venue staff were adamant that I couldn't bring in some biscuits and a can of coke, I was showing them my insulin, my blood monitor, but they were relentless. "I've been to countless places where I've had my bag searched and people have said 'you're not allowed to take drinks in' and you really have to explain they're there not there just because I want to consume them, they're there as a medical necessity. "As a diabetic, it is frustrating because if I am not allowed to bring a sugary drink into a venue, it means I have to pay their inflated prices. "Taking a hypo (a fall in blood sugar level) at something like a gig or concert could be as serious as life or death." Type 1 diabetes can develop at any age, but usually appears before the age of 40, particularly in childhood. Type 2 diabetes tends to develop later in life and is often linked to lifestyle and being overweight or having a family history of type 2 diabetes.